Connect to pins that are located on the forms Master and servant. 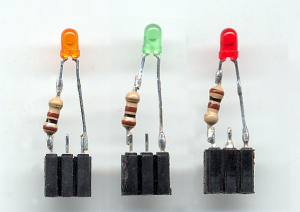 For LEDs you can use any pin of InOut. 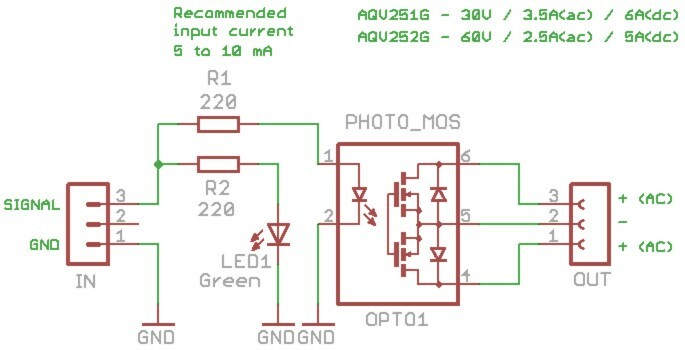 Configure the pin as “Digout” to operate “On-Off” or “Pwm_8” or “Pwm_16” in order to adjust the led brightness from zero to maximum. The LEDs can be connected directly or with a resistor in series to limit the current, According to the following table. The “PIN” InOut is protected in the current, If you exceed the 15 mA, for even a millisecond, the entire door shuts down temporarily. Furthermore, due to the inrush current of led internal capacity is always a little greater than that calculated. 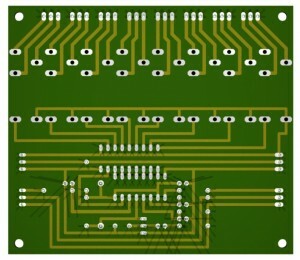 Therefore, If you connect the led voltage drop of less than 2 Volt without resistor, may cause you to exceed 15 but unexpected flashes of all exits and experiment that belong to the same port of the processor. Therefore with the modules of the first versions, It's always good to use with a resistor in series from 100 ohm resistor. And’ useful to have colored LEDs soldered on female connectors from three terminals with step 2.54 that can be used as Jokers during setups. These little indicators of great help for teaching where you need to add or remove components quickly in order not to lose the attention of students. 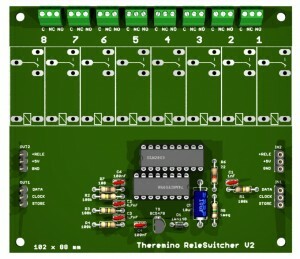 The new thremino system modules (from the series 3 onwards) have an internal resistor of limitation whereby all LEDs can be connected directly, without resistor. 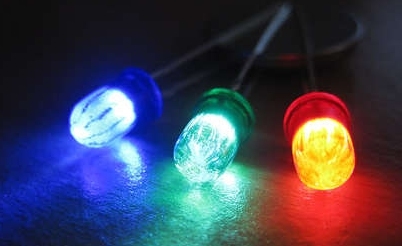 It might still be a good idea to always connect the LEDs with a very low value resistor, 10 Ohms or less, in order to highlight the positive wire. 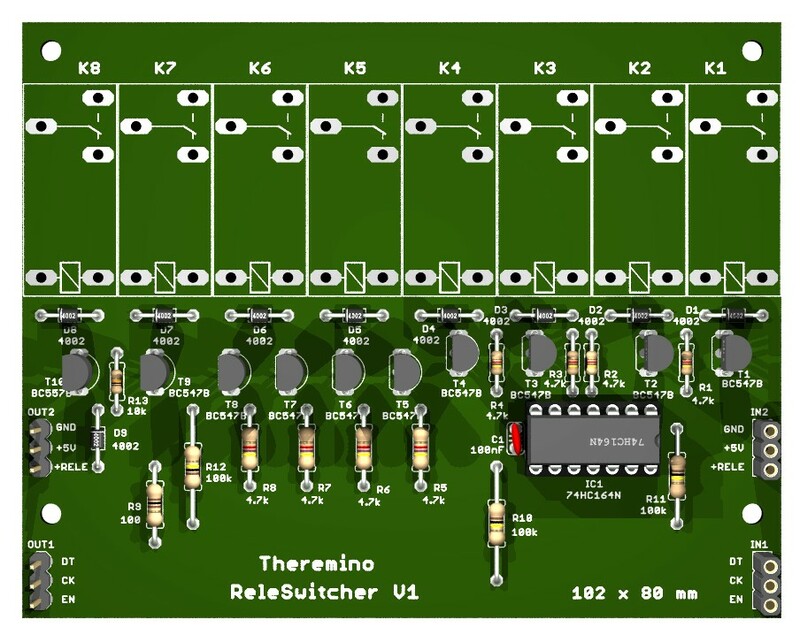 Always connect the positive side of the led resistor (the longest thread) so you have a reference when you will put these indicators on the connectors of the system Theremino. Also inserting the LEDs on the contrary do not damage anything, just the led does not light up. 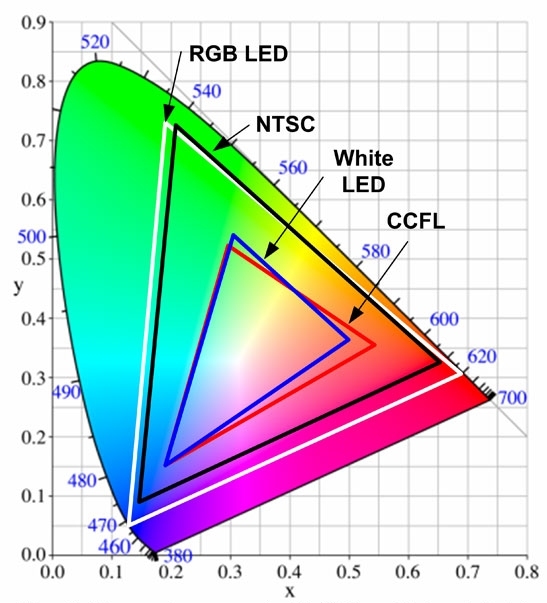 With three green led, Red and blue light can be generated by any color, including black and adjust the intensity and color saturation from 0 to maximum brightness available. 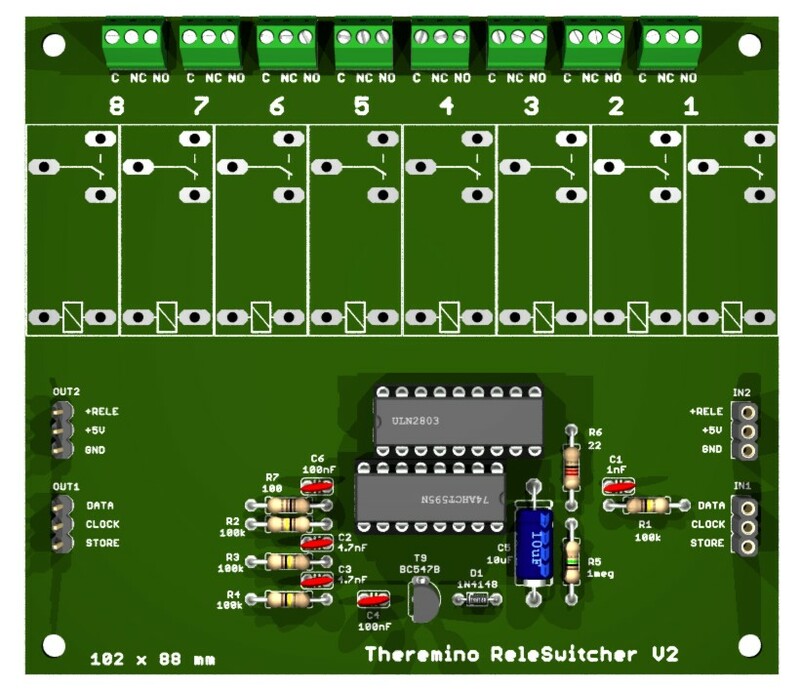 The three LEDs should be connected to three Pwm channels and independently controlled either manually or with a dedicated host program. To obtain a uniform color is preferable to use 5 mm LEDs with beam wide enough and top it all with a screen in Opal material or thin white paper. Choose among the brightest led available in the market and connect them with a low-value resistor, as indicated at the beginning of this document, will be clearly visible even in very bright environments. High power LEDs must be fed with a constant current usually from 300 but to 700 but they are delicate and require precise control of current. To feed them there are many models of drivers & power supplies. This is very similar to a normal relay, but it has features that i didn't even dream of mechanical relays. Can switch in a millisecond, lasts virtually endless, requires only 5 Milli Ampere of pilotage, has exceptional insulation and is very small. Also the spare PhotoMOS can be easily replaced on the base, even with different patterns and possibly even with the cheap PhotoTRIAC to use for application in AC. 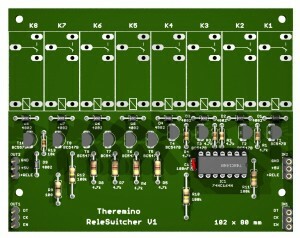 The input connector is a 3-pole, so follow the standard Thereminico which provides + 5VDC central pole. But in this circuit the +5 Volt is not used, then you can use two single cables Dupont for signal and to GND. 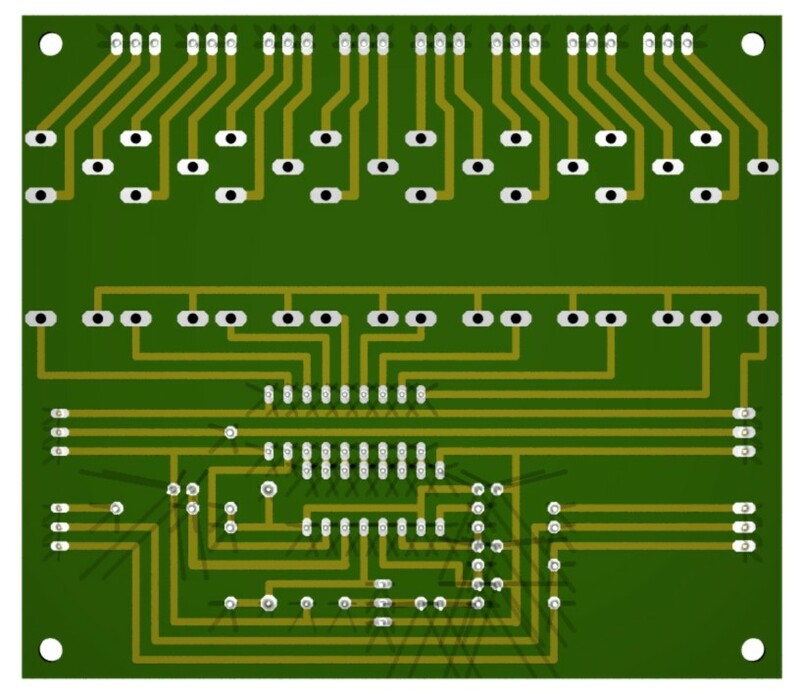 If you have to drive multiple forms together, you could combine the Central Server with GND, with a spot of solder on the bottom of the print. That way you could carry only one bulk cable (GND) and then use the Central Server to bring mass to neighboring modules. This project is lucky. It concerns to the Chinese for automating machines screw-setting machines they use in production, then takes precedence over many other, It will be produced in record time and will soon be available on thereminostore. STL files are also available to print a plastic support for a form opto-relays or for four modules opto-relays. 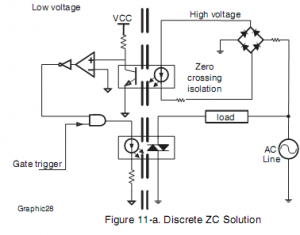 Why use PhotoMOS instead of mechanical relays? 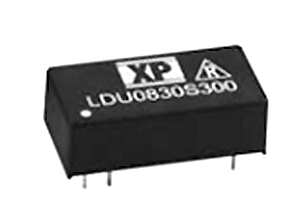 Mechanical relays cost ten times less and bearing currents and voltages above, but they last Sun 200,000 operations. Might seem to many, but doing the math you may have some surprises. 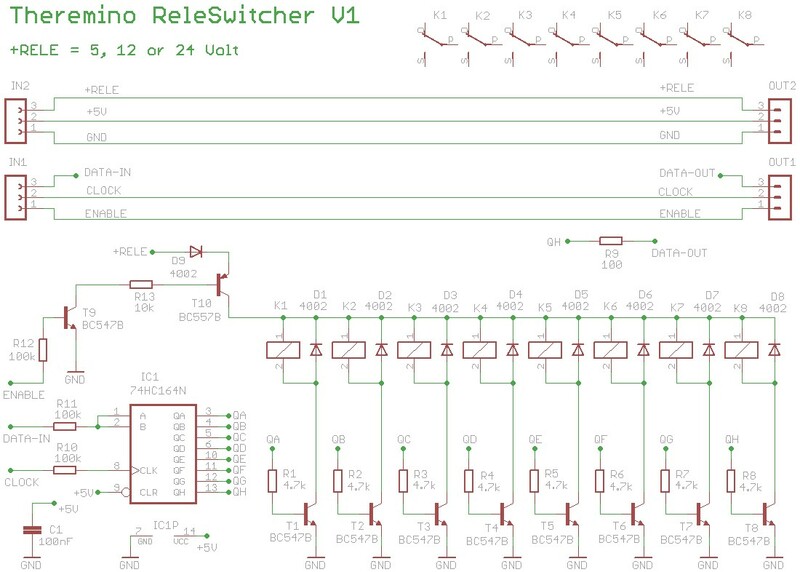 In a case of example (We're designing a car wrench), There are two relays that switch twice every six seconds. If the machine makes production 24 hours on 24, How long will the relay? Maybe a few years? Wrong, each week will be both faults. Since then the production machines are five, and soon to be ten, probably every day there would be one or two under repair. That's why, in some cases, You can't use the mechanical relays. Why not simply use a Mosfet or Darlington? In this same page, some current projects show even greater bearing adapters and cost less. In some cases you may use them, but only a photo-MOS can give complete safety, to completely isolate the logic, from electrical disturbances caused by heavy loads, especially if inductive loads. Depending on the connection, you get a relay for AC or DC. With the connection “C”, usable only in “DC”, you get a doubling of the maximum current. The currents and voltages listed in this table are the maximum bearable. To be on the safe side it is good to keep lower than at least one 30%. If you plan to use frequent switching (beyond the 20 Hz) It is good to be limited even further (see the graphs in data sheet). If driving inductive loads in DC (Transformers, solenoids and motors), each load must have the diode for over-voltage in parallel. 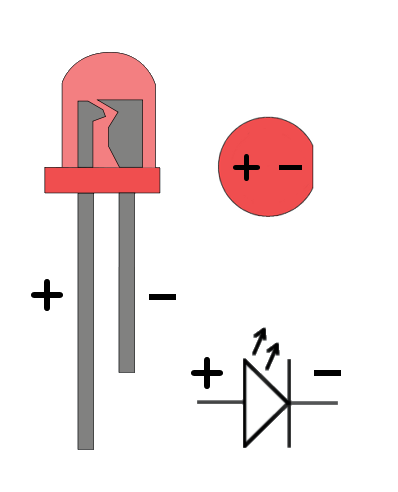 If driving inductive loads in AC (Transformers, solenoids and motors), each load must be in parallel, the suppressor for over-voltage silicon (Transzorb). To achieve an effective protection, the Transzorb must have the correct voltage and current characteristics. Limited to applications in AC you can replace the PhotoMOS with a PhotoTRIAC. The PhotoTRIAC are cheap and withstand high voltages (from 400 to 800 Volts), with current up to 1 Ampere (but it is good to use them no more than 500-700 mA). Be careful to use the models shown. Must be models with drive 5 mA, otherwise it will not work well, or will stop working with low temperatures. The models “Zero crossing” just switch to the passage of the zero (then at most 100 times per second). You can use them to control the power, but on the other hand guarantee clean switching, without causing extra-potentially dangerous voltages. Please note that the PhotoTRIAC, Unlike PhotoMOS, You must use only the two extremes (4 and 6), While the Central (5) should be left unconnected. This circuit is very similar to a power switch. Can turn on and off large loads, such as furnaces and boilers. 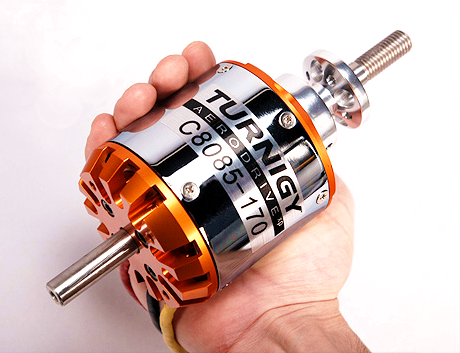 And it also works well with inductive loads such as motors, Transformers and large electromagnets. By means of a photo-coupler “Zero crossing”, the switching times are always at the precise moment of the passage of the zero. Then the commutations are clean, the electromagnetic interference are completely absent and do not develop dangerous voltage extra-. The TRIAC must absolutely be BTA series (or equivalent) so you have the metal part well insulated (2500 Volts of isolation). So you can attach it to metal parts without having to interpose an insulator. Anyone to think of using non-isolated TRIAC and make do with mica insulation. You can't trust a home insulation with mica, the danger is real and everything can happen! The photo coupler must be a MOC3063 or a MOC3083. These two models are content to 5 but the cockpit and switch to the passage of the zero. Are important features and you have to respect them. 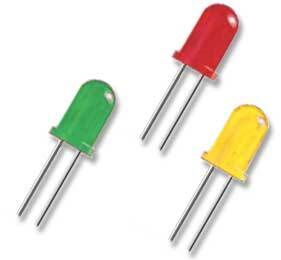 Similar projects, for example light controllers for incandescent lamps, usually include a fuse on the PCB. 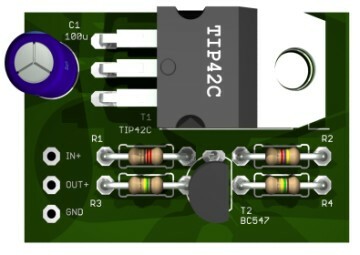 The idea would be to protect the TRIAC and would be a good idea if it worked, but in practice the fuse stops after the TRIAC has already melted. 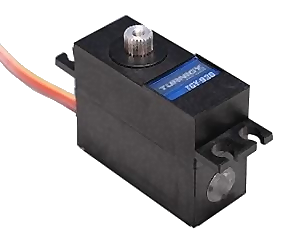 Moreover, PCB fuse holders are usable only up to 6 Amps and, as much as there are interchangeable glass fuses, also from 10 Amperes and over, their use is not in the rules and there is a risk that make precarious and dangerous contacts. And finally, incredible but true, quality fuses, that would have any hope of protecting the TRIAC, costing twice the TRIAC. Then this PCB fuse function is performed by the track that goes to the top clamp. This track is smaller than the other and will break in case of emergency. With “emergency” do not plan to protect the TRIAC, but to avoid melting the wires in the electrical system or trigger the automatic. If you plan to work in 16 Ampere (and even bigger addition with TRIAC), It should strengthen the two slopes ranging from screw until TRIAC. Up to 10 Ampere just increase the thickness of the slopes, using the pond and the welder, beyond the 10 Ampere you should add a bare copper wire, welded on the slopes. Always fit a small stretch of track, without tinning and without copper wire, with the function of emergency fuse. Or you can add a panel mount fuse holder. Up to a hundred Watts, there are no problems, the TRIAC might also be without heat sink. But to get to 3 KW and beyond, a heat sink is absolutely necessary. The right solution for dissipating well is not to invent a small heatsink (as with slots), but take away the heat with an aluminum bracket and draw on a large metal surface, probably the container itself. A good solution is a “L” of aluminum, as wide as the metal of the TRIAC, and thick 2 or 3 mm. With this “L” distance from live parts and fastening made easy. The vertical part of the “L” can be screwed to a large metal wall, that will provide the dissipation request. Be very careful! The area outlined with the red line is connected to the mains. 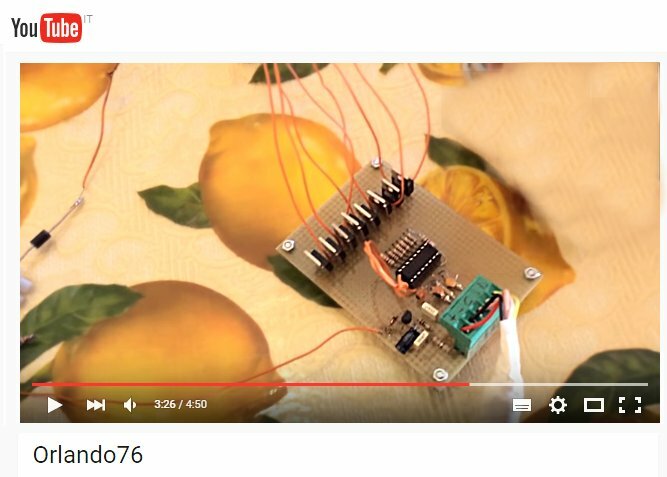 Therefore we recommend this project only to those familiar with electronics. For safety reasons, you should use an insulated container. The metal part of the TRIAC is isolated internally, and therefore can be screwed directly onto an aluminium heatsink. However you should be careful to build well the heatsink, its shape must be precise so as not to get too close to the metal parts under voltage. 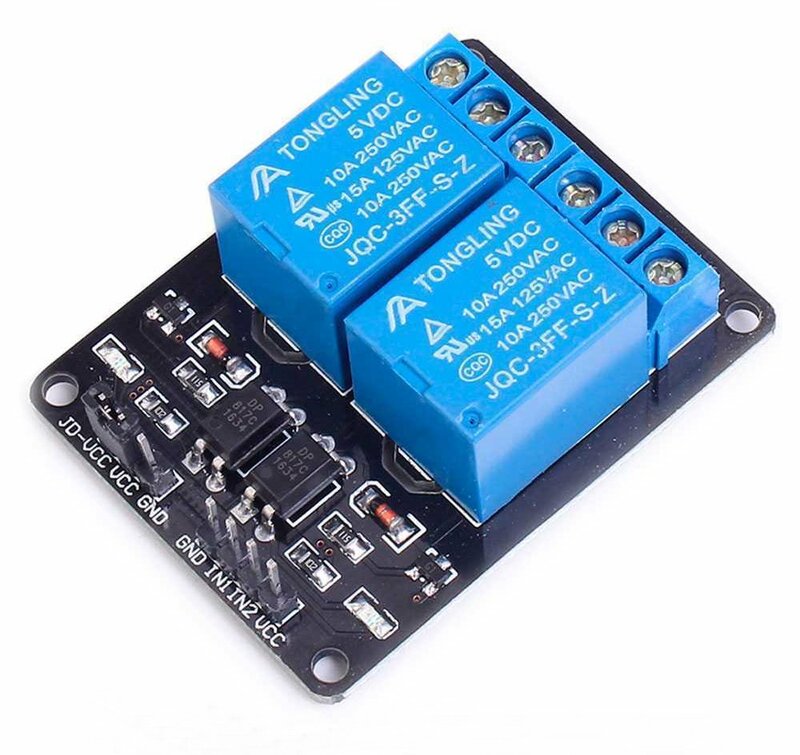 This adapter can power relay, search engines constantly, solenoid valves, low voltage bulbs, LED strips and any other actuator that needs a few volts DC voltage up to 60 Volts with currents up to 2 Ampere. 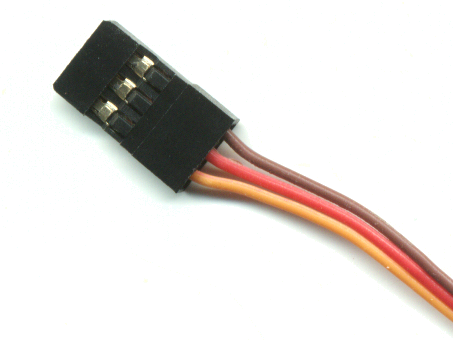 The CN1 connector connects to any PIN of InOut system Theremino and provides the ground connection and the signal of the first channel. 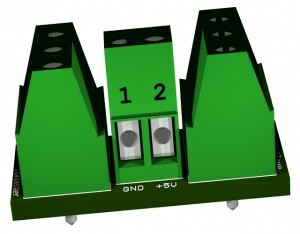 The connector CN2 connect to signal pins three InOut adjacent and provides signals for the other three channels. In this way they connect four channels with only two standard extensions. The connectors CN4, Cn5, CN6 CN7 and exits are for actuators. Please note that most of the actuators must be connected with the correct polarity. 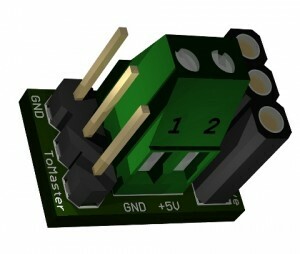 Using the arrangement of components shown here you can realize this adapter very easily even on a scrap of stripboard. 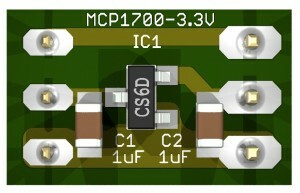 Surface mount type MOSFETs have a distance between the pins compatible with standard distance 2.54 mm between the holes. Connectors and resistors are on the higher side without copper, the MOSFETs are welded on the side opposite. With four pieces of wire recovered from the resistors you make the connections and within minutes the adapter is finished. There are also other mosfet similar to those recommended by us but you should be careful that must be very low with Gate-Source threshold voltage (less than 3 volts) otherwise I will close fine and warm with strong currents. This circuit can be built “for air”, with the help of some small pieces of plastic, or Thermo-shrinking sheath, to isolate the critical points. 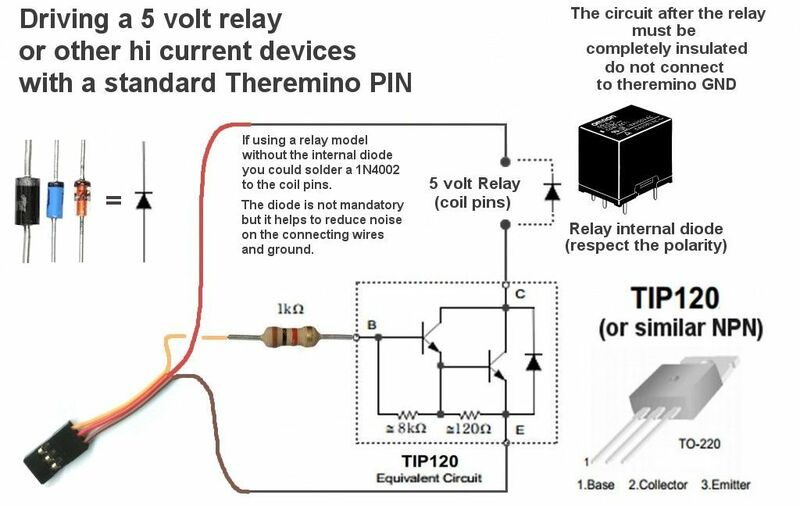 The output current of the system Pin Theremino (maximum ten milli amps), It is enough to drive LEDs, photos-couplers and solid state relays. But to drive mechanical relays, or other users, as the engines continues, higher currents are required. 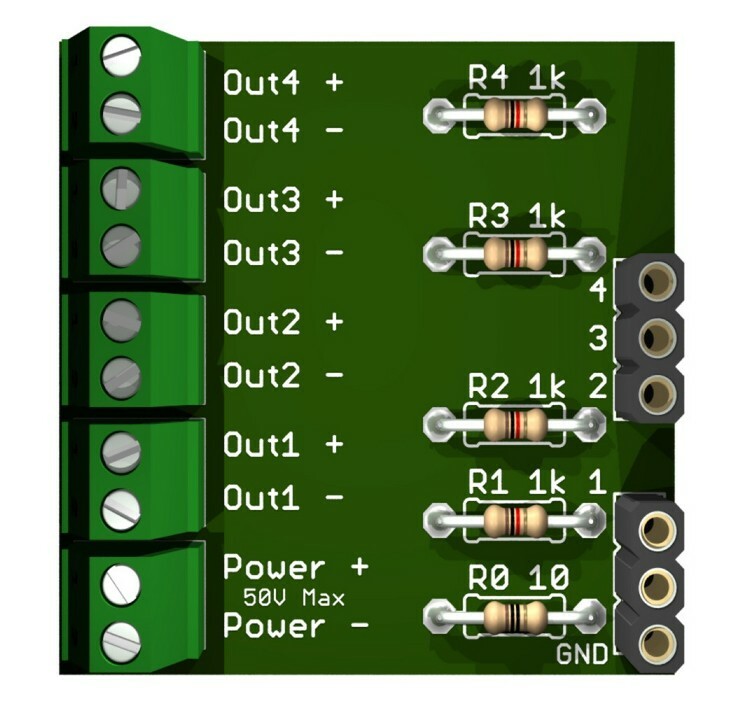 The maximum controllable current with this circuit is the maximum current supplied to the USB (almost 500 but with the USB 1 and 2, and almost 3 Amperes with USB 3). Until the currents are small (50 or 100 mA), the protection diode on the transistor is enough. But in the case of large inductive loads (mechanical attraction reels, large relay or large motors) It would be better to add a 1N40xx diode in parallel with the relay (or motor). Even in this case, with the collar upwards (towards the +5 Volts). 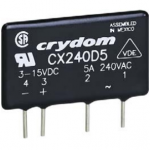 For low currents (up to 50 or 100 but small rele) you could use small transistors (BC237, Bc337, Bc547, Bc548 and similar…). With these transistors you should add a protection diode on the relay coil, with the clamp on the positive side. How can fit the protection diode 1N4148 or similar. 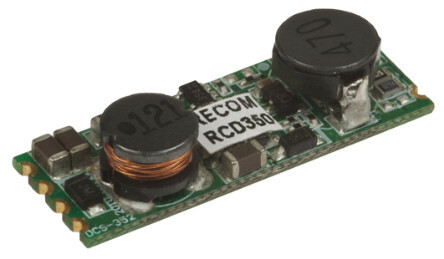 These small relay absorb only 50 but to 5 Volts. We tested in practice that any small NPN transistor can fit. So you can build a small circuit. To secure the connection cable and isolate components, You can use two drops of hot glue. In these pictures the transistor is a BC548, the diode a 1N4148 and the resistor is from 1 k (1/8 watt). Click on images to enlarge them. 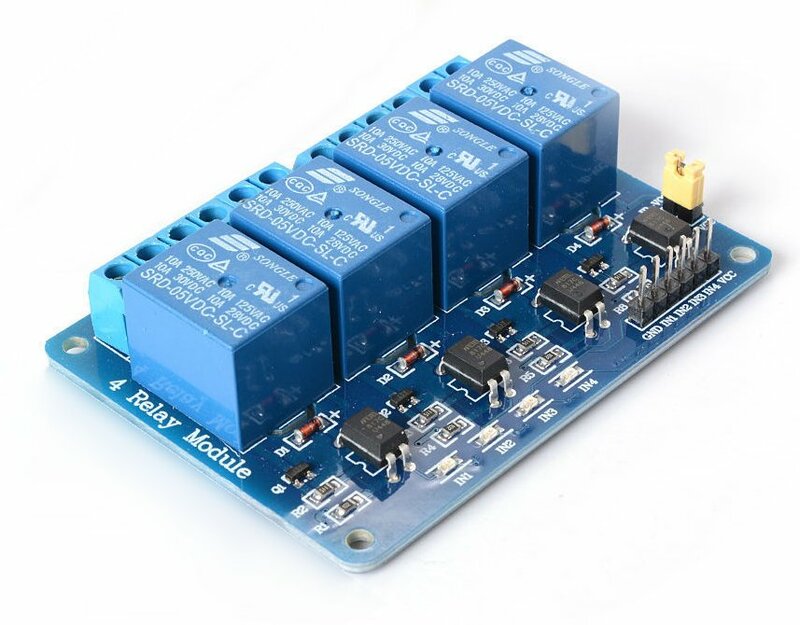 On eBay you can buy modules with full electronics mechanical relays to control them. Make sure they are suitable for feeding 5 volts and are drivable with a TTL signal, that's enough the 3.3 volts of output signal from the Master Pin. 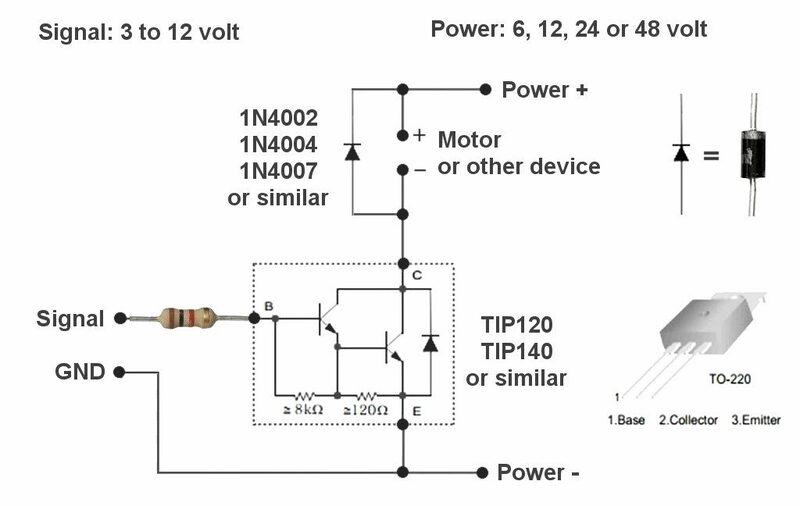 Almost all models should accept a TTL signal, so even from 2.5 or 3 volts up, but some may want 5 volts and fail to light up with just 3.3 volts. 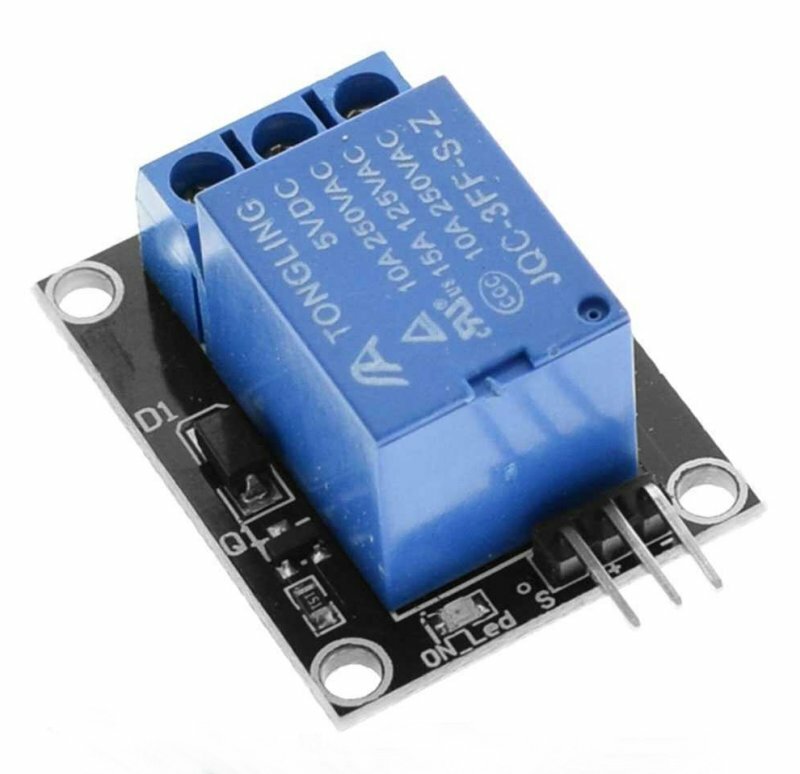 Mechanical relays bear more current and more tension of solid state relays and are also cheaper. The only ones own inferiority are the duration (from 10 thousand to 100 thousand switching cycles), and the slowness of switching (several tens of milliseconds). Whereby they can drive with Pwm signals (but always with Pin configured as DigOut). And’ important to note that most of these connectors modules do not have the same Master Pin arrangement. Typically have a mass in the Middle, While the Master has the mass on one side and the 5 volts in the Middle. 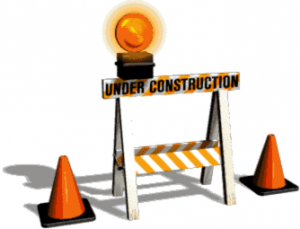 This means that you will have to cross the three wires, and be very careful to link giusti. For all examples shown here only the latter has the same Master Pin arrangement, i.e. Signal / Positive (+5) / Negative (GND). High current gain (you pilot a few milliamps and controls many amps). High current bearable (until a few amps without heat sink, and up to tens of amperes, If well cooled, and depending on the model). High voltage bearable (almost all support at least 80 volts and some models come up to 120 volts). The control signal usually arrives by a Pin of the Master module, configured as DigOut (Remember to also connect the ground wire GND). If the load I bear, You can configure the Pin as Pwm (or FastPwm) and adjust the current average that you supply to the load. The Pwm load quickly on and off. Why don't you get a real linear adjustment of current. However in some cases, such as Leds or engines, you get a pretty good adjustment. Power + and Power points- You must connect a power supply with proper voltage to the load to be fed. The power supply must also be able to provide a maximum current sufficient (that is at least 20% or 30% greater than that normally is sent to the load). This simple circuit can be useful in many cases to power small engines, relays and electronic equipment in General. If the load is inductive, such relays, You must put a diode in parallel to the load 1N4002 (Alright a 4007). You can stop voltages up to 50 Volts and currents up to many Amps. 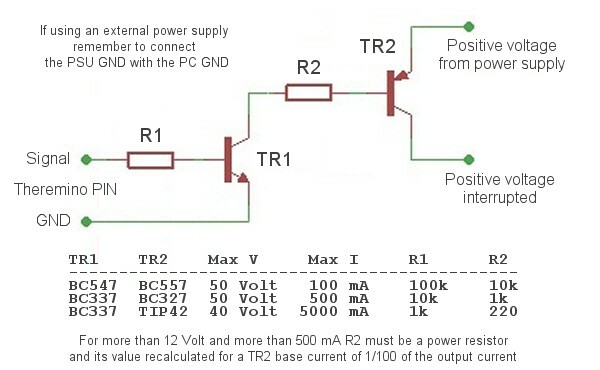 If you supply enough current to the base of T2 (at least one-hundredth of the maximum current) then the voltage drop will be very low (under 100 MV). Simply stop the positive voltage is to be able to keep the masses of PC (and then the system Theremino) and masses of energized circuit. 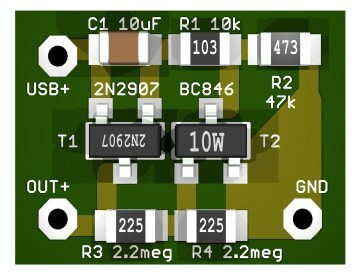 In all cases (even with the Mosfet circuit) the mass of the PC and the external power supply must be connected to each other. You can use a yellow-green, combining the GND terminal of the external power supply, with a strong point of mass on your PC. A good place where to connect the wire from the PC side is the mass of USB ports or the mass of the USB cable that goes to the master. This pilot relay module (or other low-voltage devices). To increase the number of channels, you add other modules. Connects each module to the previous module output. All channels are independent and the number of channels is virtually unlimited. 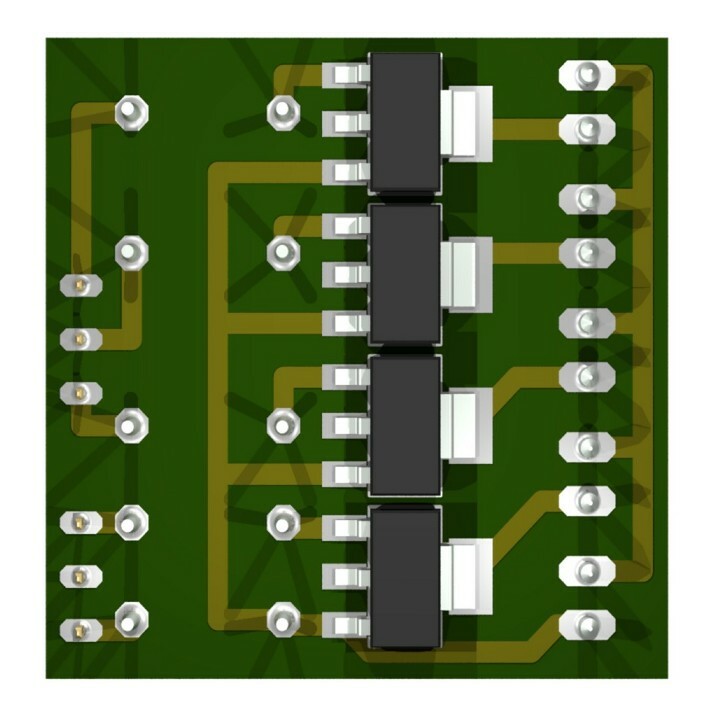 The circuit board is designed with all components at step 2.54 and without overlapping of slopes, so you can mount it fast on a Breadboard to one side (less expensive). You start with three Suns Pin, configured as DigOut and connects this form at the end of a long shielded cable, with four internal wires (but you could also use an unshielded cable intercoms). The cable can be up to several hundred meters. Only one Master unit could drive two of these lines, doubling the speed of execution. 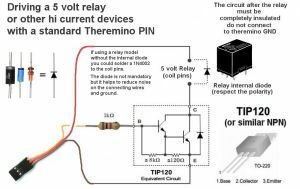 – The relays must have the coil from 5 Volts and possibly low current. – The connection cable must not cause a voltage greater than one volt. – The current of all relays switched on should not exceed 500 but the USB port. With the 5 Volts should be able to fly about 16 rele, with a few dozen meters long cable for telephones (for 2-wire intercom cables power have the greatest). Better still to reckon, with the current of the relays and the cable resistance. 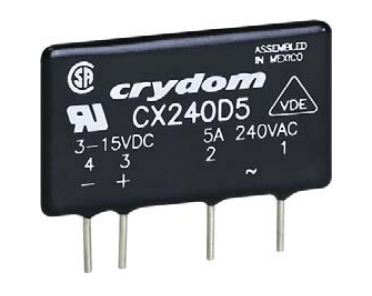 To increase the number of relays and lengthen the cable without limits, You must feed the Switcher Relay modules, with a local power supply from 5, 12 or 24 Volts. The power of the relay is protected against reverse polarity, but you have to do the same attention. You don't have to miss the connections with the Theremino, better to use a cable with the coloured threads. With 8 channels the handling is so rapid that the relay is not the behind. But also over time 100 Ms are adequate for these applications. 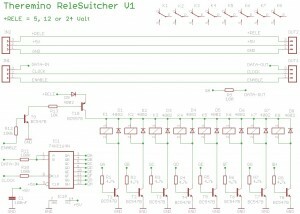 The relays are not designed to switch dozens of times per second. The handling is of the type “break before make” i.e. : before the relays that were turned on are turned off, then turn on the new ones. All this happens in a very short time. This method has improved safety and did not result in accidental starting. Attention: use a 74AHCT595. The HC and HCT would not work because they do not have the inputs of type SchmittTrigger. Signal filters slow the rising and lowering and versions without a Schmitt Trigger could count more pulses, of those actually sent. 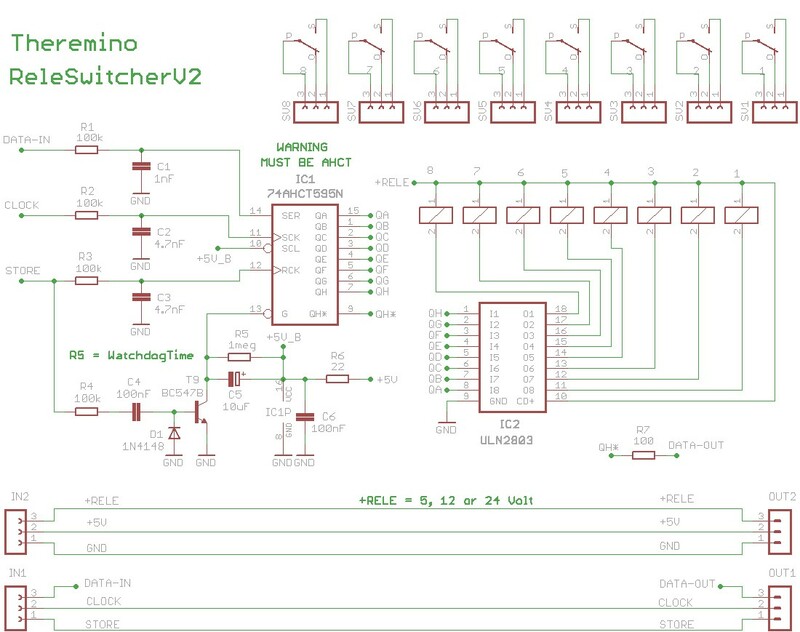 The circuit is simpler thanks to ULN2803 replacing the relay driver transistor. All inputs are filtered to avoid any noise coming from cable. And’ a WatchDog circuit which keeps the ignition all the relays are turned off, until the computer starts to transmit. The WatchDog also checks that the computer continues to periodically send the signal “Store”. Then, If your computer stops or the cable comes off, After a few seconds all the relays are turned off. With the watch you have to raise and lower signal periodically “STORE”, at least once per second. Someone might not want to, or maybe make the first tests without and add it later. To delete the WatchDog gets to ground Pin 13 by IC1. And in this case you could also delete the components R4, C4 D1, T1, C5 and R5. 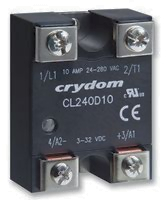 To increase the number of relays and lengthen the cable without limits, You must feed the Switcher Relay modules, with a local power supply from 5, 12 or 24 Volts. If you are using a local power supply be careful not to accidentally connect 12 or the 24 volts to the wires that go to the Theremino Master. The most updated (It also controls the WatchDog of ReleSwitcher V2) is the “ReleDriverV6”. 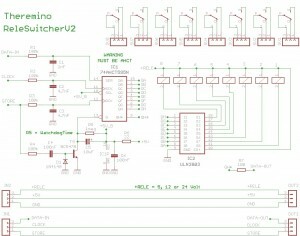 The Relay Switcher Version 2 have an internal safety circuit, but in some cases it is better to provide a second safety circuit, completely electromechanical. Typical examples are the spectacular explosions and explosive tubes for launching confetti. In these cases the Master container, you add a switch, like the one shown here on the left. If the switch is in OFF, then the yarn STORE, coming from the shielded cable, is disconnected from the master and connected to GND, the same shielded cable. If the switch is in ON position, then the yarn STORE, coming from the shielded cable, SIGNAL is connected to the wire that comes from the Master. For maximum safety always switch OFF this is held and you turn it just a few seconds before the moment of start. 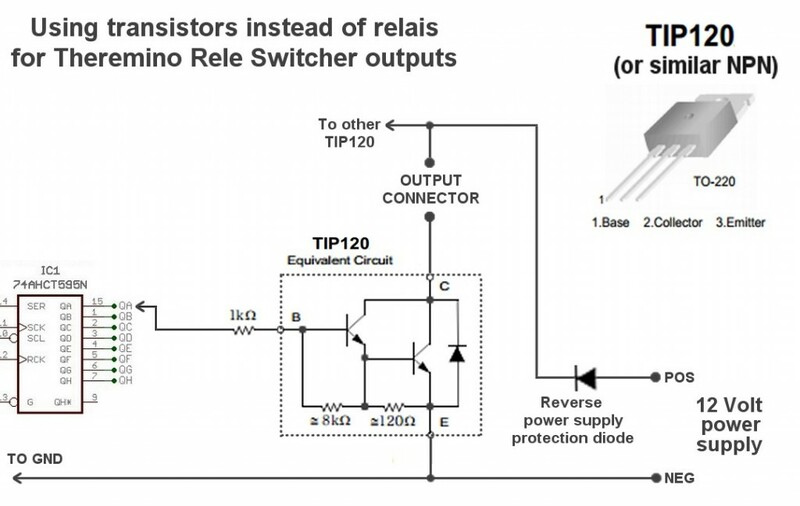 In some cases it might be a good idea, use of transistors instead of relays. Without power supply mass relays, must be in common, with the mass of digital logic, and finally, through the connection cable, even with the mass of the Master from which the signals. Without relay, You can more easily receive disturbances, from the power supply and mains power. 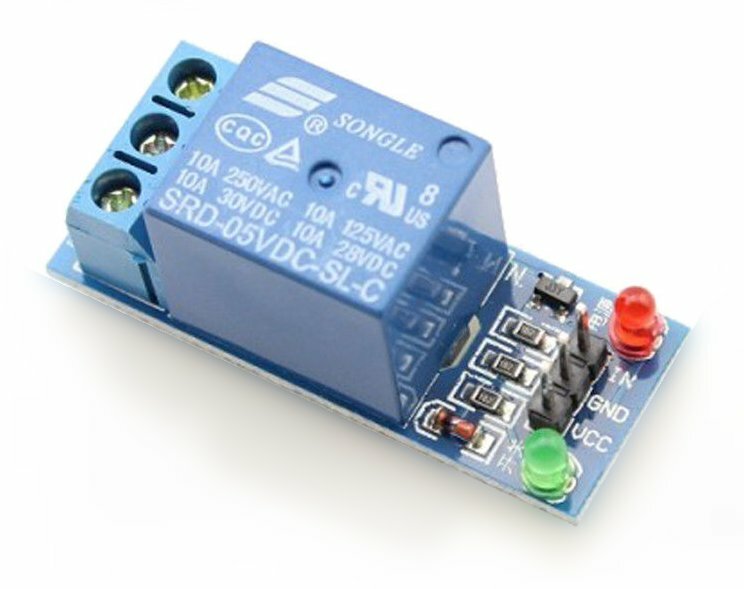 Finally, without relay will have to be more careful, If you fail any connection you could send 12 Volt logic and burn the integrated, or even damage the Master module. Instead of the TIP 120 you could use similar transistor (must be darlington and NPN). Or you could use N-type MOSFETs (making sure that they work well, with gate voltage under 3 volts). MOSFET suitable could be the IRLB8721 (302.5 Volt-Gate 0.5 ohm v 60A 0.009 euros). 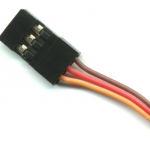 Or you could use the BP318S or the other mosfet shown on this page for DriverOnOff. On YouTube you can see how Edge Nibs has created the relay Switcher. Orlando was the creator of this project, did the trial operation and guided us in realization of control software. These regulators are similar to ordinary “Dimmer” but I'm more linear, bear also inductive loads, are protected against short circuits and are isolated up to 3000 volts for maximum security. These actuators exist in two versions, “zero crossing” and “random”. The models “zero crossing” ensure that always switching when the voltage is low:, reducing to zero the electrical noises caused by turning on and off and can therefore be used with any type of load from the most delicate to those hard, inductive and great power as welders, spot Welders and large engines. 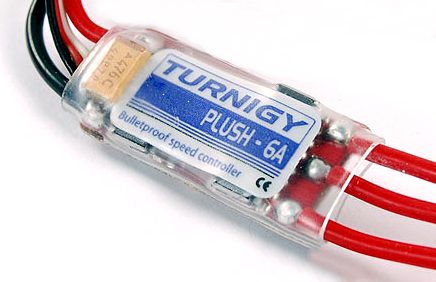 The models “random” switch in a very short time (about 1 mS) and can then be used with a Pwm output to set power continuously but beware: You can adjust randomly only resistive loads, pretty much only incandescent lamps and heating elements, other loads would create strong electrical noise and may also be damaged. Be careful to choose models with piloting in DC and with 3 minimum voltage volts, otherwise with 3.3 volts you will not manage to turn them on. The points 1 and 2 must be connected in series with the device to be controlled by making sure you maintain a good insulation distance from connections 3 and 4. 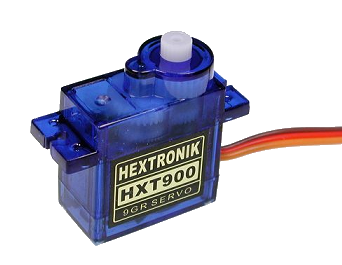 There are servos and motors of all kinds and power, they are ideal for many applications, plug into a “Master” How can’ controlling up to six or “Slave” of type “Servant” It can fly up to ten, you choose “Servant” How to PIN type and you're done. Some sensors and actuators require limited current regulated power supply or. In some cases it is also necessary to adapt the signal from 5 Volts to 3.3 Volts.